Sometimes, there is no better way to get a feel for the land your visiting than to hit the road for a good old-fashioned daytrip. It’s often the best way to discover the magnificent landscape and diverse cultures surrounding beautiful Santa Fe. 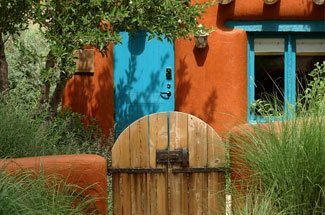 From our luxurious bed and breakfast, a Santa Fe daytrip to nearby Taos, Abiquiú, Chama, Los Alamos, Madrid, Pecos or Las Vegas are just a hop, skip and a jump away. 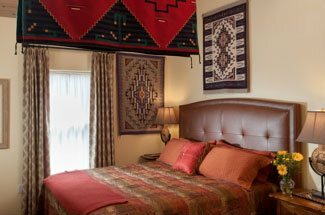 Book your stay at Four Kachinas Inn, and take the time to travel north of Santa Fe for a unique cultural, historical, and geological experience. At Four Kachinas Inn, we’ve created 2 different Santa Fe daytrip itineraries to the north that will help you make the most of your visit to our remarkable city. Start off by heading Northwest to O’Keefe Country where you’ll see firsthand the sandstone cliffs, tree-lined river beds and juniper covered foothills that inspired famed American painter Georgia O’Keefe. While on this beautiful Santa Fe daytrip, don’t miss the village of Abiquiu where you can take a guided tour of O’Keefe’s restored hacienda. Nearby, dont miss a visit to the famed Ghost Ranch. There is also abundant hiking and outdoor recreation available in the area. Continue further up the road, and you’ll find Los Ojos, where you can visit the showroom of Tierra Wools, a weaving cooperative where the art of traditional Hispanic weaving still thrives. Make it a full daytrip, and head to Chama, where you can ride the Cumbres & Toltec Scenic Railroad. Head north on our Santa Fe daytrip, and you’ll run into the charming town of Taos. While in the area, visit the the historic 700-year-old pueblo, Nambe Pueblo, and nearby Nambe Falls. Chimayó, located south of Taos, is a small town famous for the Santuario de Chimayó. This historic church, built in 1814-1816, has been the destination of countless pilgrims who attribute it with miraculous powers of healing. 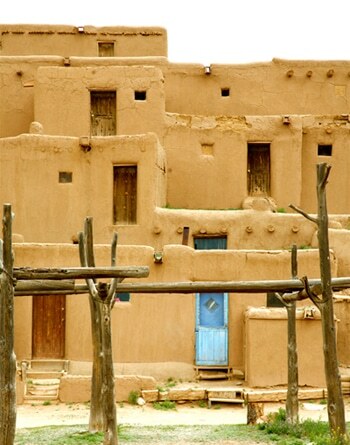 A visit to Taos would not be complete without viewing the amazing multi-story adobe structures of the Taos Pueblo, built between 1000 and 1450 AD. You’ll also have an opportunity to visit the Millicent Rogers Museum, the Taos Art Museum, San Francisco de Asis, and Ohkay Owingeh (formerly the San Juan Pueblo). In these daytrips, we’ve only provided you with a tiny glimpse into all of the amazing things to see and do north/northwest of Santa Fe. Bring with you an appetite for exploration, because there are many more Santa Fe daytrip itineraries and activities to choose from.